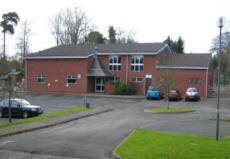 The Village Hall is situated in the Heart of West Hill and is adjacent to the primary school close to the Village shop. It is a focal point for many activities and clubs in the West Hill area including dancing, short mat bowls and badminton. The hall has a very large main room suitable for badminton, dances and plays together with a number of smaller rooms, which are be used for other activities such as bridge, yoga and brownies etc. In addition, the hall has extensive kitchen facilities and ample parking for private events etc.